la inmolación de indio hecha historia. Underground railroad vía Coahuila expreso. a Reaganomics y un pulmón del altiplano. capitolio se pintaba de colores. son conceptos codependientes y sin vigencia. No se hable más señor oficial. Y mira que Arizona es bien lejos. ¿Todavía necesita saber mi nombre? 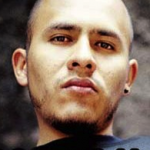 Bocafloja: published poet, spoken word and rap artist, born in Mexico, currently living in New York. His body of work is primarily focused on issues such as institutionalized racism, colonialism, and is rooted in the proliferation of non-traditional forms of knowledge. He is recognized in Mexico as the pioneer of the utilization of hip hop culture as an alternative tool to create awareness, developing a different form for political participation that reaches and is more relevant to marginalized youth.